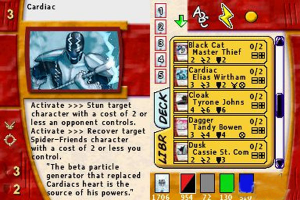 "Online trading card game with Marvel characters"
Trading card games are complex games that consist in managing a deck of cards with different powers each other. Players must use smartly their cards to win the game. In this case, Marvel Trading Card Game brings you the fantastic Marvel universe to trading card games. Feel the power of the Incredible Hulk, Captain America, X-Men, Spider-Man, Thor and many more in your hands with this popular game. You can play this game against the computer or with some other friends on a LAN private network, but the best way is to play connected to the internet. Marvel Trading Card Game has a legion of fans around the world that you will be able to play against by getting online. There are tournaments where you will enter just when you possess certain cards, and even some other sponsored championships that pay their players. Graphics are standing out in this game that will make you have fun with Marvel characters.